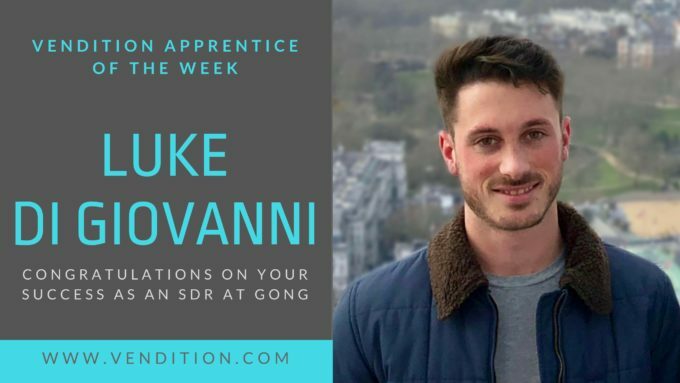 This week, we recognize Luke Di Giovanni at Gong as Vendition’s Apprentice of the Week. Since September, Luke has been bringing energy to the phones and loving it over at Gong. Luke graduated from college in Italy and knew he wanted to make the transition into tech sales upon graduation. We were first introduced to Luke by Pat Wilson, an alum of the Vendition apprenticeship and a high school friend of Luke’s. “I originally found out about Vendition through someone else who went through the apprenticeship, Patrick Wilson. He does cyber security sales now, and we knew each other from high school. He told me about his experience with Vendition, and it sounded like a perfect fit for me. I had just graduated from college with a completely different background, and I felt like making the transition wasn’t so clear since I didn’t have a business degree. I studied food and wine in Italy, and I wrote my senior thesis on how tech was changing the food industry. I knew I wanted to go this route somehow. In regards to his coaching sessions with Ashleigh, Luke shares that she helped him out the most by really emphasizing that he should memorize everything at first and then turn that into something of his own. “She basically said, ‘Don’t be afraid to do what’s best for you.’ Something else she told me to do was to bring energy on the phone however I can. I walk around, back and forth–I always take calls standing up, I smile more on the phone, and these little things help me have energy. Luke’s tips are working for him, too. In November, he tripled his quota expectations, and in the months leading up to and after November, he’s never missed quota. We couldn’t agree more, Luke! Keep up the great energy and great work. We know there’s so much more in store for you at Gong and we can’t wait to see it, either.